Last week I got a package of polishes from Pretty & Polished. They were a mixture of two upcoming collections, and I was ecstatic to see which ones I would be swatching and reviewing. 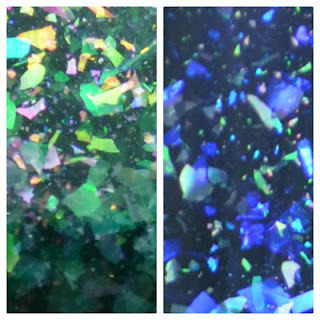 It was practically kismet that I received two flakies from The Opal Collection. Flame Queen is a green jelly packed with multi colored flakies. This color was inspired by the Flame Queen Opal which is perhas the most famous of all opals. The formula was ultra smooth, and all of the flakies laid flat on the nail. I used three coats to achieve full coverage. Boulder Opal is a purple jelly packed with multi colored flakies. This was inspired by Boulder Opals which are only found in Queensland Australia. They are the second most valuable opals in the world. The formula was nice, but I did encounter a few flakies that didn't want to lay flat. It wasn't anything that couldn't be fixed with a thicker top coat. I used three coats for full coverage. Overall I really love the theme and formulas of this flakie collection. If you love flakies as much as I do, you won't want to miss the release of these on Friday, November 14th. Both polishes look so good. Love how the flakie bits seem to be glowing from within. Mmm, Boulder Opal is pretty!